Vedas contain the rituals portion and the knowledge portion. The rituals portion containing upasanas as well is spoken of as Veda purva Bhaga or Karma Kanda. The knowledge portion which comes in the end is called Jnana Kanda or Veda anta Bhaga. 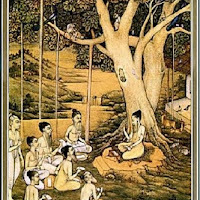 Upanishads which occur in Veda anta Bhaga are referred to as Vedanta as well. 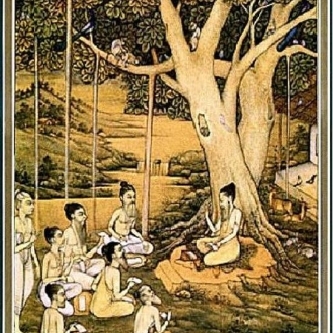 The word 'Upanishad' is given many meanings. One of them is by splitting Upanishad as upa+ni+shad where ‘Upa’ stands for ‘to approach’; ‘ni’ stands for ‘steadfast’; ‘shad’ for ‘to destroy”. Together the word ‘Upanishad’ is interpreted to mean that knowledge, which destroys the ignorance of Brahman of those who approach it with shraddah and mumukshutvam and steadfastly abide by its teaching, in short BrahmaVidya, knowledge of Brahman, the Cosmic Supreme. Besides Brahman, the Upanishads also deal with Jeeva, the individual and Jagat, the Universe and their mutual relations and these discussions form the core of Vedanta system as Upanishads are one of the Prasthana Thraya on which the system is based. Let us see them from Advaitic view-point. Brahman, Paramathma, is one without second and is Nirguna, without Gunas, Nirakara, formless, and Nirvisesha, without attributes, and impersonal and Brahman is Sat, Chit, Ananda i.e. Existence, Knowledge, Bliss in their absolute pure nature. Sat, Chit, Anandha constitute the intrinsic nature of Brahman and should not be treated as attributes, Nirguna Brahman has an unmanifest power, Maya. Brahman with this inscrutable, undefinable power of Maya manifest is called Saguna Brahman or Iswara. Saguna Brahman and Nirguna Brahman are not two Brahmans, one the antithesis of other. It is the same truth from two different points of view, one Paramarthika point and the other Vyavaharika point i.e. transactional point. Jagat, the Universe, a product of Maya, is mithya, vyavaharika satyam, transactional Reality. It is available for experience, transactions and is useful but it is not absolutely Real, and it is only the unchanging Brahman that appears as the changing universe through Maya. Jeevathma, is the real Self of the individual, Jeeva, who is a combination of Self, Jeevathma, and non-Self, anathma. The entire body-mind-intellect complex is anathama and material and Jeevathma is the life force that lends sentiency to anathama through its manifestation in anathma. Jeevathma is Pure Consciousness, Chaitanyam, and is not different from Brahman, Paramathma. So Jeeva in his essential nature is same as Brahman and this identity is termed Jeeva-Brahma-aikyam, and this knowledge, Brahma Jnanam. The statements in the Upanishads that spell out this Ikyam are called Mahavakhyas. 3) Tat Tvam Asi – “That thou Are”. This occurs in Chandogya Upanishad of Sama Veda. 4) Ayam Athma Brahma – “This Self is Brahman”. This occurs in Mandukya Upanishad of Atharva Veda. 1. Adhyathmikam – Obstacles arising from within oneself like one’s personal ill-health, negative mood etc. 2. Aadhi bauthikam – Obstacles arising from other known sources or external situations like ill-health of a family member, noisy neighbourhood etc. 3. Aadhi daivikam – obstacles arising from unseen sources like floods, storm etc. The Upanishads belonging to each Veda have a unique shanti mantra. Let my speech be rooted in my mind. Let my mind be rooted in my speech. Let Brahman reveal Himself to me. Let my mind and speech enable me to grasp the truths of the Vedas. Let not what I have heard forsake me. Let me spend both day and night continuously in study. I think truth, I speak the truth. May that Truth protect me! May that Truth protect the teacher! Om peace, peace, peace! May He protect us both (teacher and the taught)! May He cause us both to enjoy the bliss of Mukti ! May we both exert to discover the true meaning of the sacred scriptures! May our studies be fruitful! May we never quarrel with each other! That (pure consciousness) is full (perfect); this (the manifest universe of matter) is full. This fullness has been projected from that fullness. When this fullness merges in that fullness, all that remains is fullness. Om peace, peace, peace! Mayi santu te mayi santu. May my limbs, speech, Prana, eye, ear and power of all my senses grow vigorous! All is the pure Brahman of the Upanishads. May I never deny that Brahman! May that Brahman never desert me! Let that relationship endure. Let the virtues recited in the Upanishads be rooted in me. May they repose in me! Om peace. peace. peace! Om, O Devas, may our ears hear what is good and auspicious! May we see what is auspicious! May we sing your praise, live our allotted span of life in perfect health and strength! May Indra (who is) extolled in the scriptures, Surya, the all-knowing, Garuda, who saves from all harm, and Brihaspati who protects our spiritual lustre, vouchsafe prosperity in our study of the scriptures and the practice of the truths contained therein! Om peace, peace, peace!